On 13th May 1968 the Battalion advance party moved by air to South Vietnam. The main body arrived on the troop carrier HMAS SYDNEY on 1st June 1968 and relieved 2 RAR/NZ (ANZAC) at the 1st Australian Task Force (1ATF) base, Nui Dat, Phouc Tuy Province. Two Royal New Zealand Infantry Regiment Companies, ‘V’ and ‘W’, joined 4 RAR and it became 4 RAR/NZ (ANZAC) Battalion. This union was particularly successful with the Battalion consisting of five rifle companies. Extra Signalmen, Mortar men and Assault Pioneers were also provided. During its year long tour in South Vietnam the Battalion completed 11 major operations and 5 operations of company size. It also maintained a company group at all times on the Horseshoe feature four miles south-east of Nui Dat. The scope of operations was widely varied to include offensive reconnaissance’s in force, defensive operations (mainly in the Long Binh-Binh Hoa area), destruction of enemy assets and pacification and food denial operations. During the tour of duty, over 200 enemy were killed for the loss of nineteen 4 RAR/NZ (ANZAC) battalion soldiers killed. The Battalion returned home to Australia and was welcomed by a memorable reception during a march through the city of Brisbane. The Battalion’s advance party departed on 30th April 1971 for the unit’s second tour of Vietnam. The New Zealanders had joined the advance party at Nui Dat in early May 1971, having come from Singapore. The main body arrived on 22nd May 1971 and operations began soon after the Battalion concentrated at Nui Dat. The Battalion relieved 2 RAR/NZ (ANZAC) at midnight on 23rd May 1971. 4 RAR/NZ (ANZAC) after a week settling in moved to the ‘bush’ for the remaining seven and a half months of its tour. This meant the soldiers spent their tour entirely on operations during the monsoon season. The ANZAC Battalion conducted nine operations against their main targets, the 247 Viet Cong (VC) Main Force Regiment and the 33rd North Vietnamese Army (NVA) Regiment. The Battalion received excellent support from all other arms and services during operations. 4 RAR was the last battalion to leave South Vietnam and for two months it was the only battalion left in the theatre of operations. It was actively engaged on operations until 9th December 1971 when the Battalion group less ‘D’ Company departed for Townsville on the troop carrier HMAS SYDNEY. 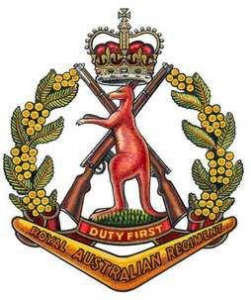 ‘D’ Company remained providing security for the 1 ATF administrative units until being withdrawn on the 12th March 1972 to Townsville. The Battalion killed 91 enemy and captured 5 for the loss of eight 4 RAR/NZ (ANZAC) soldiers. On 15th August 1973, 4 RAR linked with 2 RAR to form 2/4 RAR.